These are the six most beautiful waterfalls in Connecticut. All of these waterfalls in Connecticut are easy to get to as five of them are located in state parks. 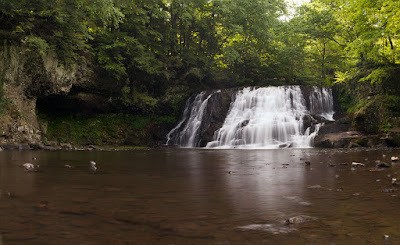 Connecticut is such a small state it's probably possible that all six of these waterfalls could be visited in one day by a determined traveler or sightseer. There are probably a lot more waterfalls in Connecticut than most people realize. 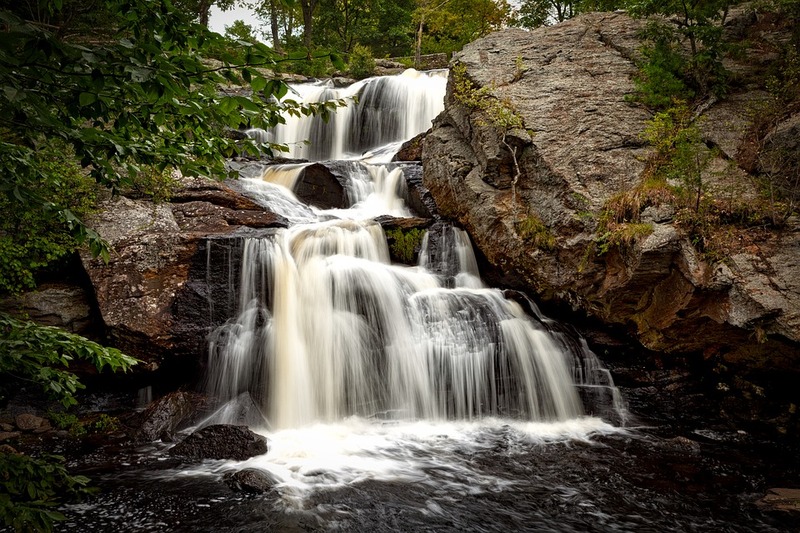 These are what I consider to be the five most beautiful waterfalls in Connecticut. I grew up in Westchester County, New York, near the border with Connecticut, and have been to most of these beautiful waterfalls in Connecticut. The capital city of Hartford is within a few hours drive of each of these waterfalls in Connecticut. Kent Falls drops a total of some 250 feet along Falls Brook in Kent Falls State Park in western Connecticut not too far from the New York State border. Kent Falls is a really nice waterfall in Connecticut, but be warned here that Kent Falls can get crowded at times in the summer and people like to wade into the pools. So taking pictures here can be a problem at times. Great Falls is a pretty 60 foot waterfall in northeastern Connecticut that flows down a ledge along the Housatonic River. 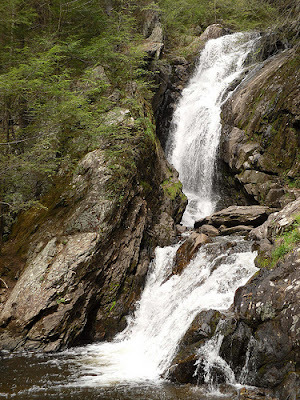 Great Falls is located right near the Appalachian Trail just north of the town of Falls Village. There is a dam above the falls that is used for hydroelectricity, so the flow over the falls can be heavy or light. Campbell Falls drops some 62 total feet along Ginger Creek in Campbell Falls State Park in Norfolk, Connecticut in the northeastern part of the state right on the Massachusetts border. 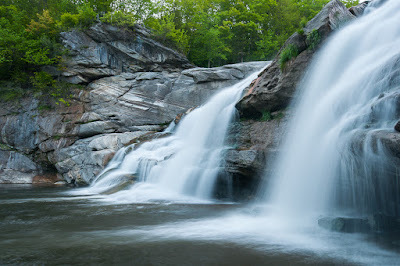 Technically, Campbell Falls might be in Massachusetts, but in any case Campbell Falls is located right along Campbell Falls Road just off Route 272 or North Street a few miles north of the town of Norfolk, Connecticut. Southford Falls is a series of natural waterfalls in Connecticut located along Eight Mile Creek just below a dam in Southford Falls State Park in Oxford, Connecticut. 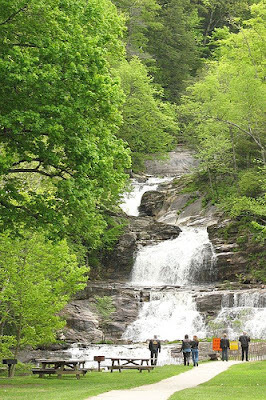 Southford Falls are not the result of the dam, but are natural waterfalls. 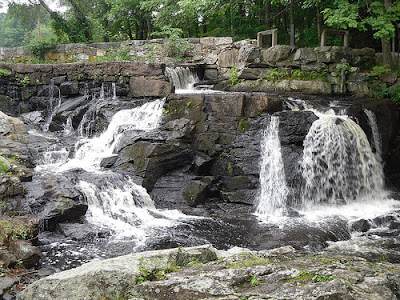 Southford Falls State Park is located right along Route 188 north of Oxford, Connecticut. Wadsworth Falls drops some 30 feet along the Coginchaug River in central Connecticut in Wadsworth Falls State Park in Middlefield, Connecticut. In spring, or after a heavy rainfall, Wadsworth Falls can really flow creating a great site to see. Chapman Falls drops some 60 total feet along the Eightmile River in Devil's Hopyard State Park located in East Haddam, Connecticut. The first photo at the top of the article is Chapman Falls. Eightmile River is different than Eight Mile Creek where Southford Falls are located.